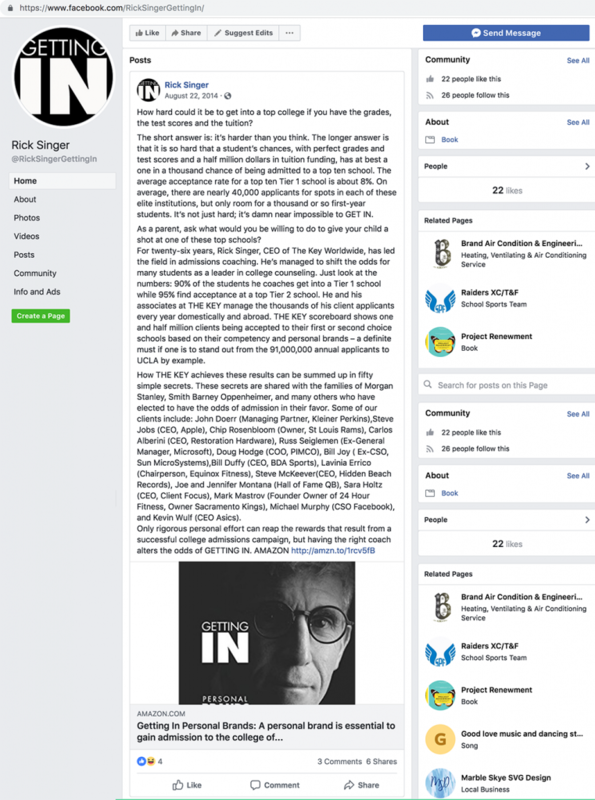 On August 14, 2014, Rick Singer, the admitted ringleader of what the United States Justice Department on March 12, 2019, characterized as the largest college admissions scandal in United States history, published a post on one of the Facebook pages he utilized in promoting the company he used to perpetrate his crimes. How hard could it be to get into a top college if you have the grades, the test scores and the tuition? The short answer is: it’s harder than you think. The longer answer is that it is so hard that a student’s chances, with perfect grades and test scores and a half million dollars in tuition funding has at best a one in a thousand chance of being admitted to a top ten school. The average acceptance rate for a top ten Tier 1 school is about 8%. On average, there are nearly 40,000 applicants for spots in each of these elite institutions, but only room for a thousand or so first-year students. Its not just hard; it’s damn near impossible to GET IN. Asa parent, ask what would you he willing to do to give your child a shot at one of these top schools? For twenty-six years, Rick Singer, CEO of The Key Worldwide, has led the field in admissions coaching. He’s managed to shift the odds for many students as a leader in college counseling. Just look at the umbers: 90% of the students he coaches get into a Tier 1 school while 95% find acceptance at a top Tier 2 school. He and his associates at THE KEY manage the thousands of his client applicants every year domestically and abroad. THE KEY scoreboard shows one and half million clients being accepted to their first or second choice schools based on their competency and personal brands -a definite must if one is to stand out from the 91,000,000 annual applicants to UCLA by example. How THE KEY achieves these results can be summed up in fifty simple secrets. These secrets are shared with the families of Morgan Stanley, Smith Barney Oppenheimer, and many others who have elected to have the odds of admission in their favor. Some of our clients include: John Doerr (Managing Partner, Kleiner Perkins),Steve Jobs (CEO, Apple), Chip Rosenbloom (Owner, St Louis Rams), Carlos Alberini (CEO, Restoration Hardware), Russ Seiglemen (Ex-General Manager, Microsoft), Doug Hodge (COO, PIMCO), Bill Joy ( Ex-CSO, Sun Microsystems),Bill Duffy (CEO, WA Sports), Lavinia Enrico (Chairperson, Equinox Fitness), Steve McKeever(CEO, Hidden Beach Records), Joe and Jennifer Montana (Hall of Fame QB), Sara Holtz (CEO, Client Focus), Mark Mastrov (Founder Owner of 24 Hour Fitness, Owner Sacramento Kings), Michael Murphy (CSO Facebook) and Kevin Wulf (CEO Asics). Among those Singer lists as beneficiaries of his “fifty simple secrets” to gaining admission to college are Apple icon Steve Jobs, NFL Hall of Famer Joe Montana and his wife Jennifer, NBA superagent Bill Duffy, former NFL Los Angeles Rams owner Chip Rosenbloom and Mark Mastrov, part owner of the NBA Sacramento Kings, CEO, founder of 24-hour fitness and a co-founder of video gaming esports team NRG Esports.